Chester’s Mayor Thaddeus Kirkland discusses the city's decrease in crime, including homicides. “The truth is there’s no way to eradicate crime, but we can and will suppress it." (Chester) — Total crime is down in Chester City, not-so-small news for a municipality named one of 30 “murder capitals of America” in 2018. Rapes dropped 52 percent between 2017 and 2018. Murders are down 38 percent during the same stretch. 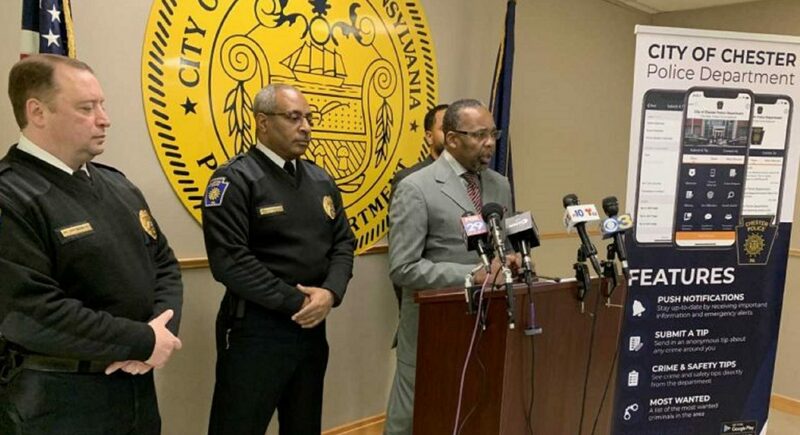 “The truth is there’s no way to eradicate crime, but we can and will suppress it,” said Mayor Thaddeus Kirkland during a Tuesday press conference at police headquarters. In 2017, the Chester Police Department recorded 29 murders, one shy of the highest total since 2000. Last year, 18 slayings took place. It was the lowest total since 2009 when police recorded 14 murders. Chester’s population was just north of 34,000 in 2017. Police Commissioner Otis Blair said his department’s “very fine” officers and cooperation from the community help explain the decline in homicides. To further boost police-community relations, Blair’s department recently launched a mobile app. Residents can use it to track crime in the city, but also to submit an anonymous tip to police about a crime they witnessed or have information about. The hope is the new app, released Jan. 17, will loosen the grip of the “no snitch” culture in the city. “One of the excuses not to participate in crime fighting or assist the police in some of our investigations was that people didn’t want to be identified or didn’t want to be involved in the long process of going to court,” said Chief of Police James Nolan.